No, this isn’t a post about my mother in law (who is a saint, by the way). 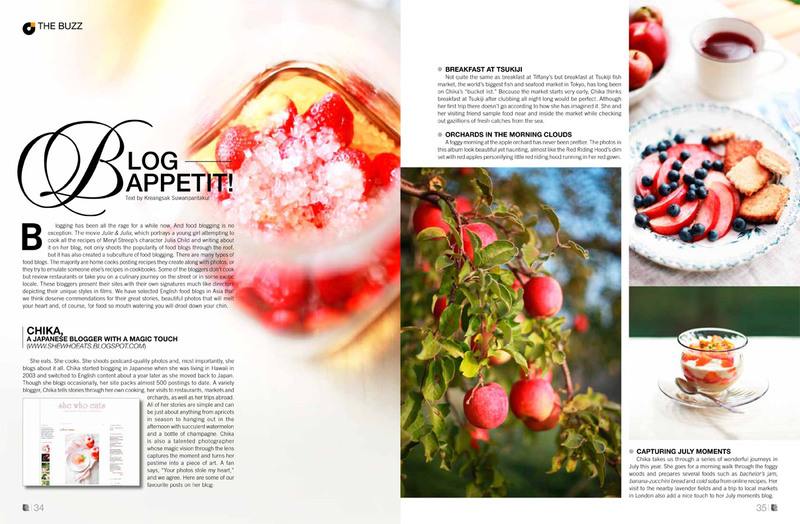 This is about the restaurant Chez La Belle Mere or if translated to English: Mother In Law restaurant. Located on on the corner of Street 55 and 240, it’s part of an evergrowing number of restaurants in the area. This restaurant has always intrigued me as it is always busy when I drive by and I thought Cambodians must really love their mother-in-laws but in reality, the draw is the food. 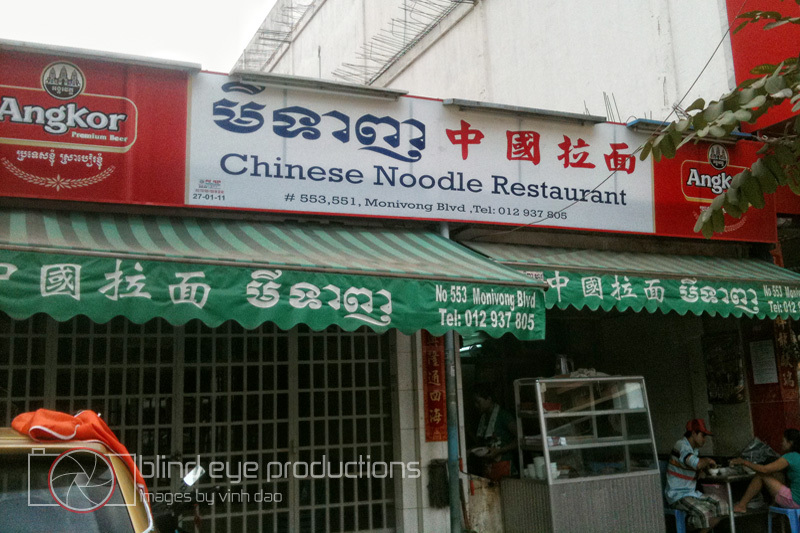 A combination of Chinese, Khmer and Vietnamese, most of the menu items range from 2 – 6 USD. 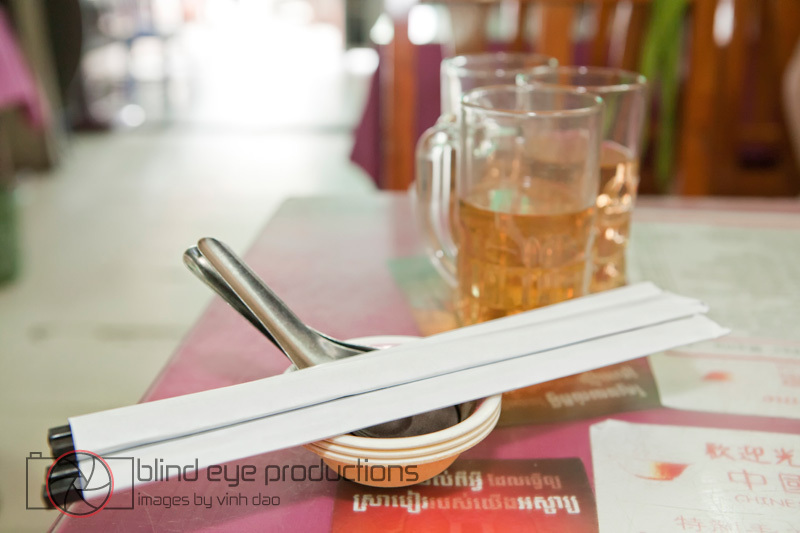 For our visit, we ordered a combination of Khmer and Vietnamese food. We ordered Tuek Krueng (Fish with Prahok Sauce $3.90), Fish Sour Soup with Egg and Shrimp ($3.90), Bitter leaf and smoked fish salad ($3.90), Banh Cuon ($2.50) and Banh Hoi Bo Lui ($3.90). 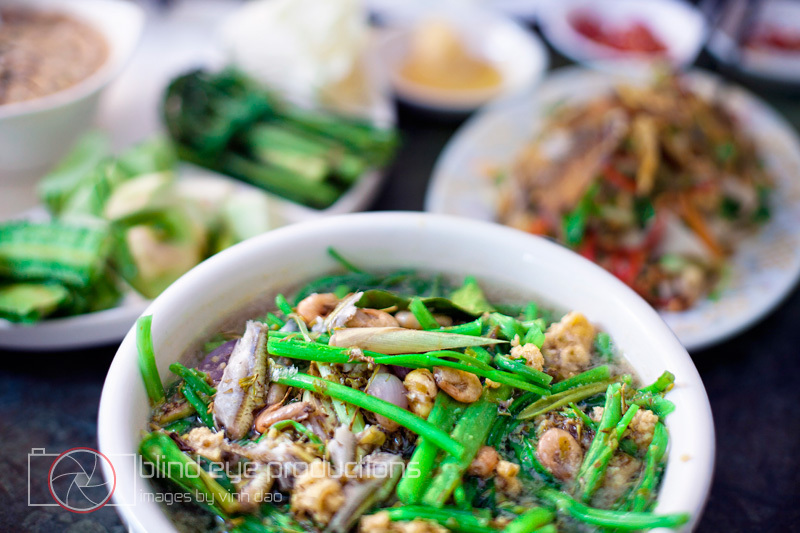 I usually don’t care for Prahok much as I feel it overpowers anything it touches but this dish was different. 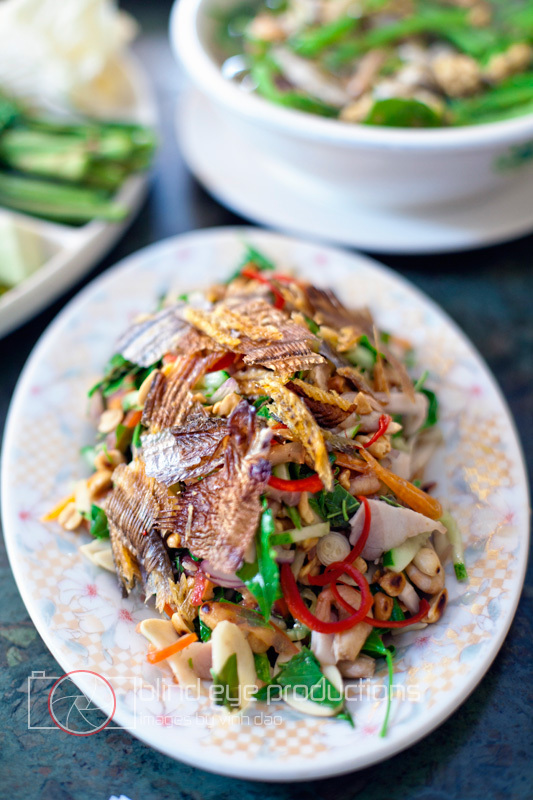 Maybe it was due to the sliced basil and peanuts which helped give this dish a bit more depth. 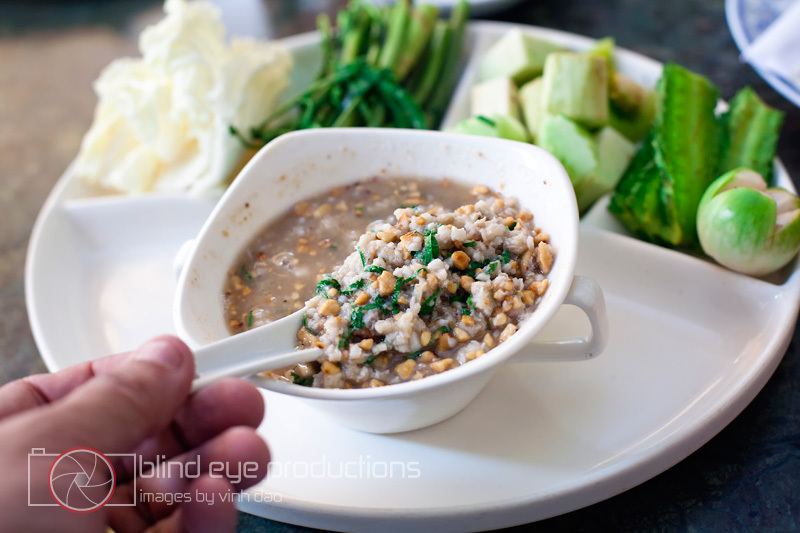 It also had to do with the Prahok was being used more as a flavoring agent than the central part of the dish. 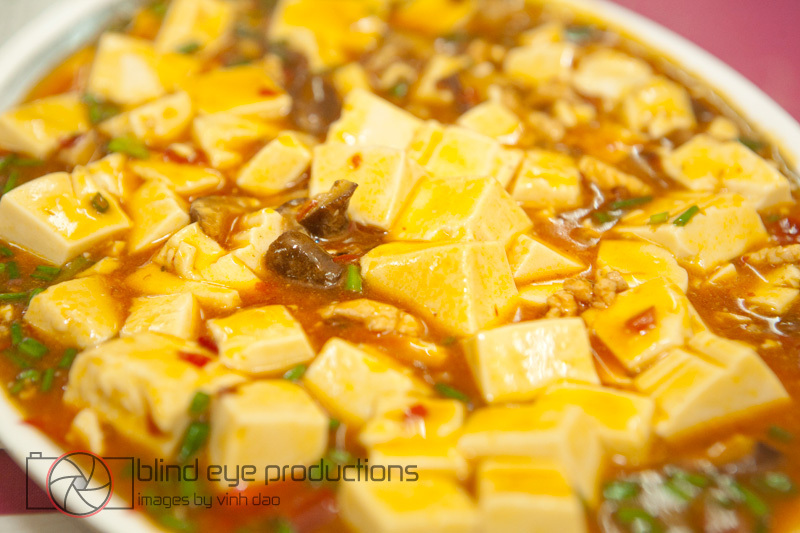 What I really loved about this the Fish Sour Soup was the abundant amounts of steamed fish egg clumps. They had a duck egg taste to them with a slight hint of fish. Yes, I know it sounds a bit wrong but you gotta try it for yourself. They tasted great! Initially, I cared the least for this salad which was a bummer as it was the best looking one of the bunch.The bitter leaf, also known as sdao, asserted it’s flavor over anything else, leaving it a one-dimensional dish. Once I managed to take most of the sdao out of the salad, it stopped overpowering and made for a great counterpoint to the sweet, salty fish sauce based dressing. 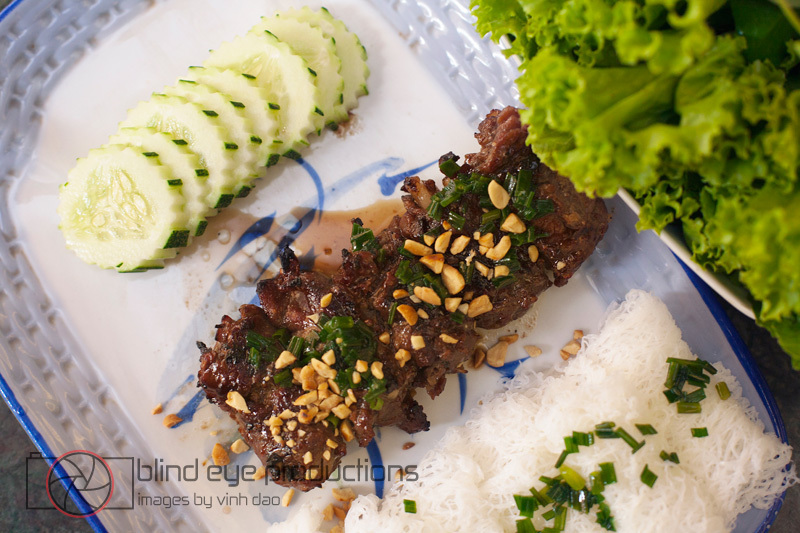 The Vietnamese dishes were polarizing. 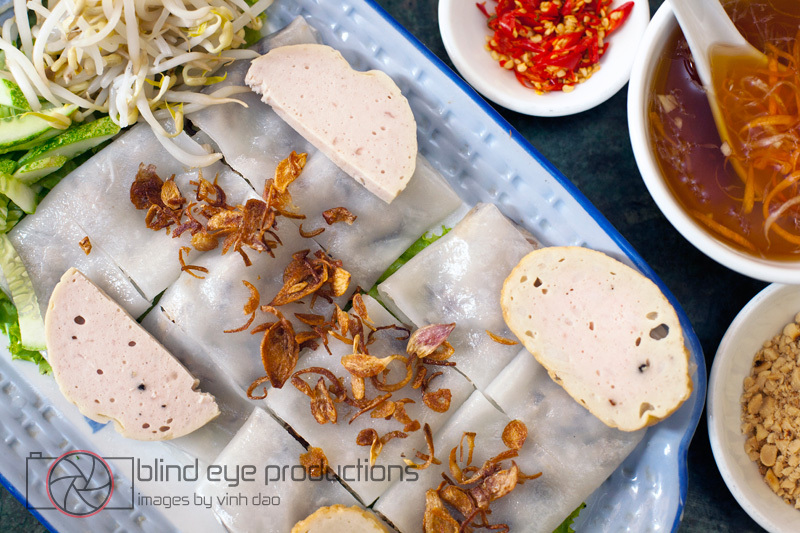 The Banh Cuon was good but I have had better and at a third of the price at the one at Chez La Belle Mere. The Banh Hoi Bo Lui was very good with the beef cooked to a rare temperature and had tons of lettuce, banh hoi noodles to make for an extremely filling dish. 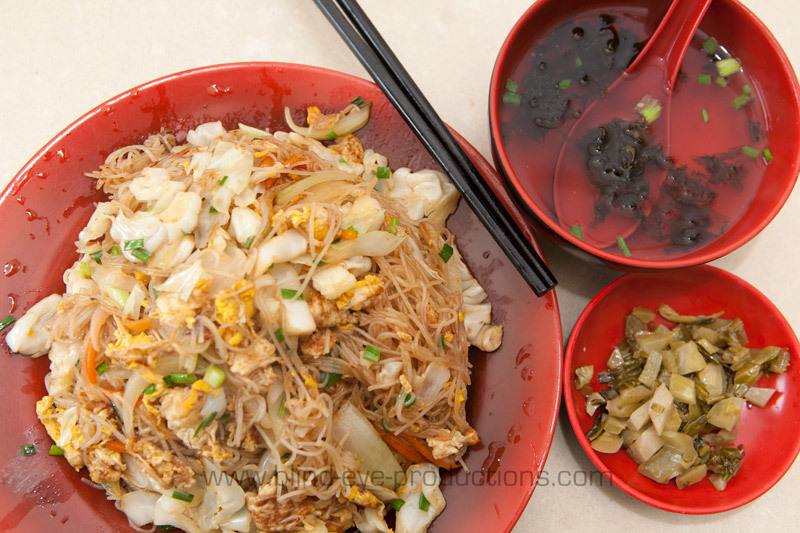 The Mother In Law restaurant is a great place to check out for the diverse menu and relatively cheap prices. 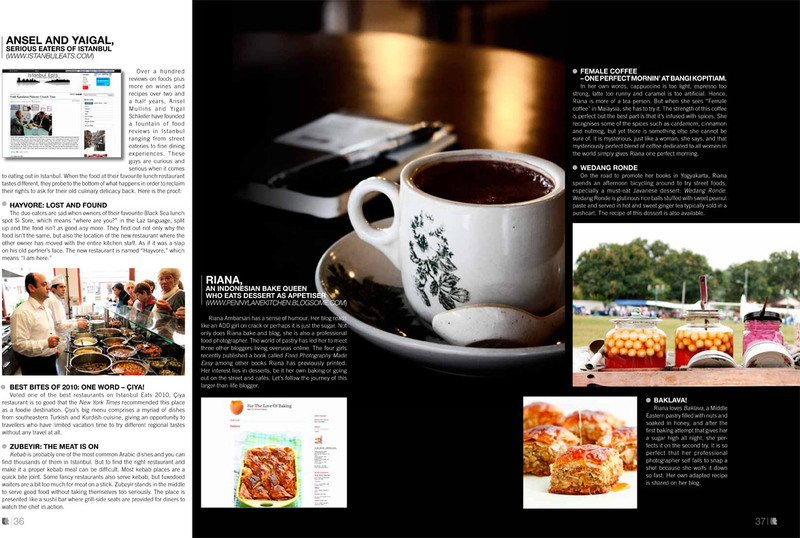 We’ve been featured in the November/December issue of Lifestyle & Travel Magazine. If you are interested to see the article in the flesh, just head to a newsstand in Thailand, Malaysia, Singapore, Indochina, Hong Kong or Bali and pick one up. Actually, can you pick one up for me too? 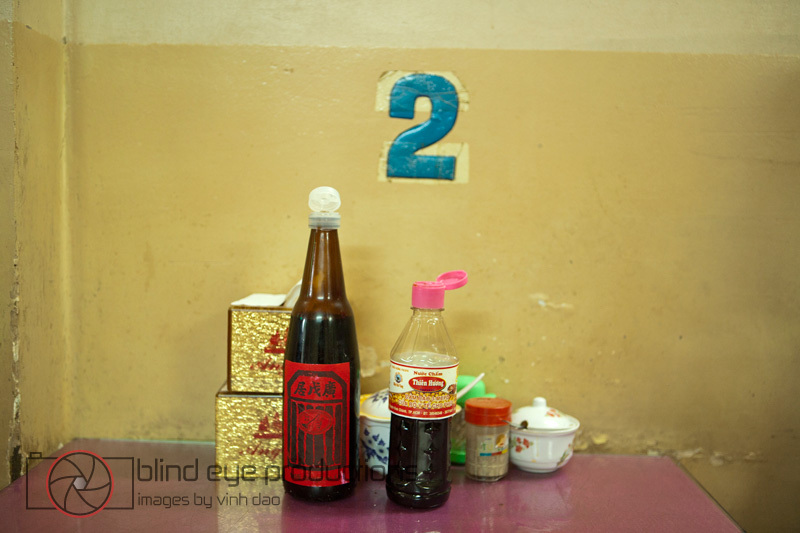 This is part of a set of reviews taken over a few days in which we gorged ourselves silly at the numerous Szechuan Chinese restaurants located near Central Market. 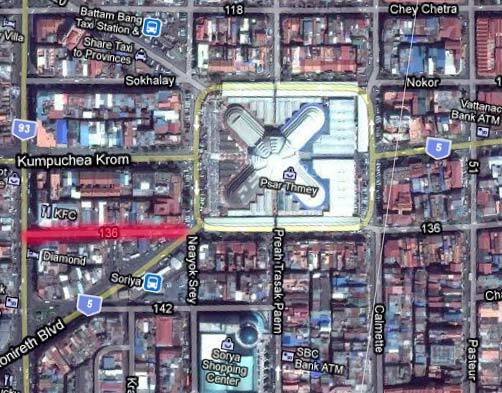 The street is 136 and the best landmark I can give is they are just east of the KFC on Monivong. I have placed a map at the bottom of the review with the street highlighted in red. 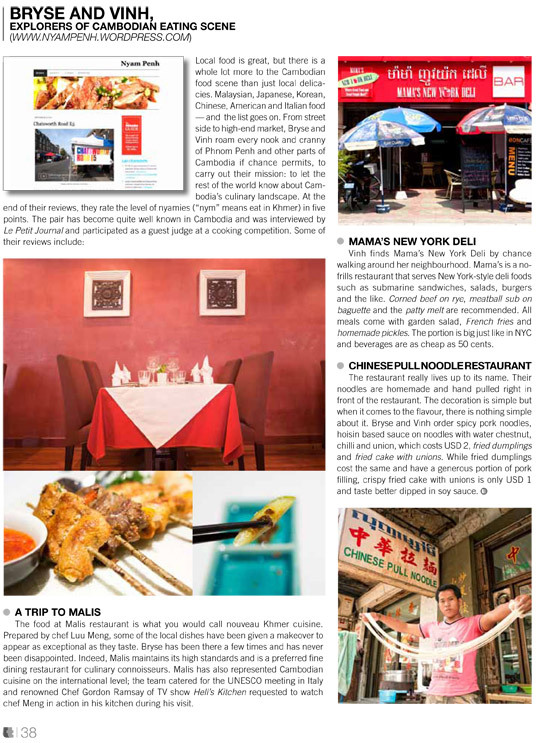 I went to this restaurant years ago when it was known as Peking Canteen. 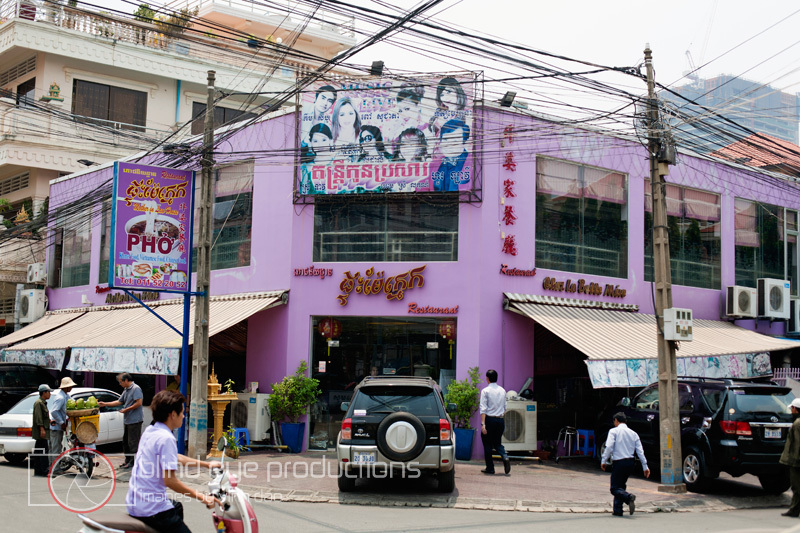 I remember it being a great place for cheap eats and a favorite of some of old Cambodia Daily crew. I guess they dropped the Canteen and put added Restaurant to give it a bit more class. I don’t actually see the big difference as the interior of the place hasn’t changed since I was there last. For the review, we ordered Noodles with Special Sauce ($1.50), Fried Pork Dumplings ($1.50), and Sweet and Sour Pork Spareribs ($4.00). 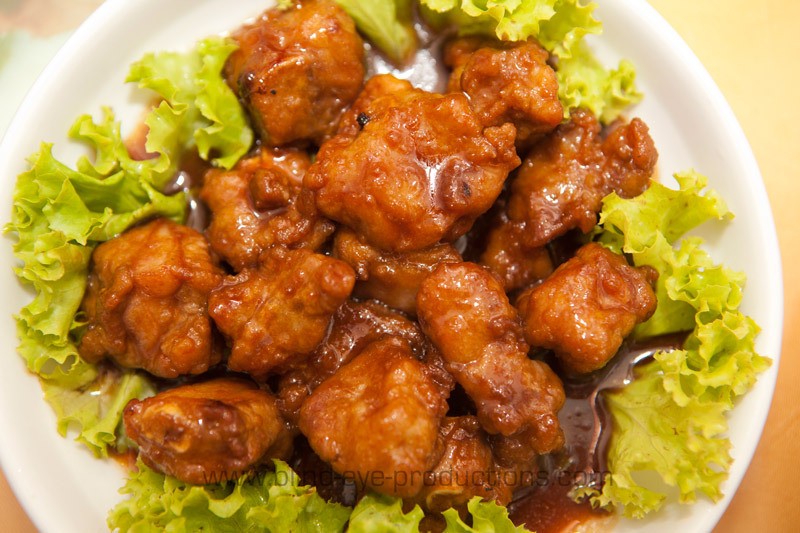 The Sweet and Sour Pork Spareribs were great with a not too sweet sauce that covered battered pieces of ribs. Also a plus was that the ribs weren’t too bony and had lots of meat to munch on. 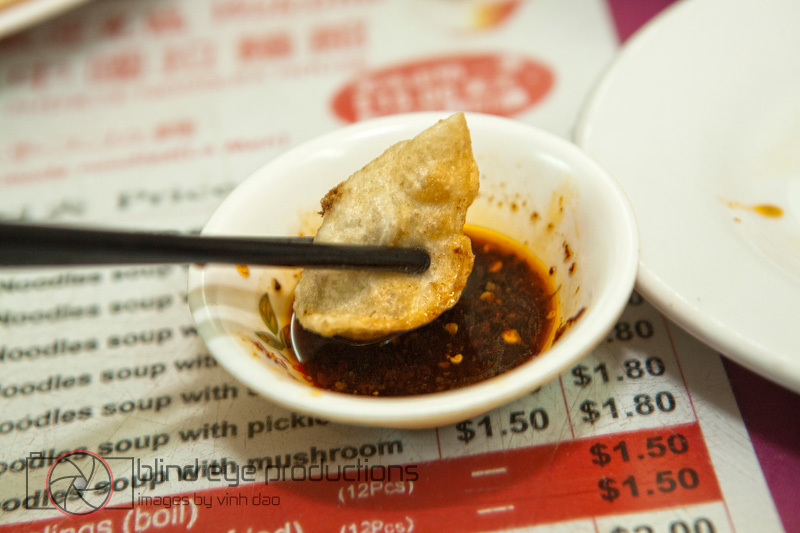 The Fried Dumplings were served on a pretty non-descript red plastic dish and I hate to admit that the dish reflected the taste of it. A pretty typical affair with a bit more meat to spring onion mix being the only notable aspect. 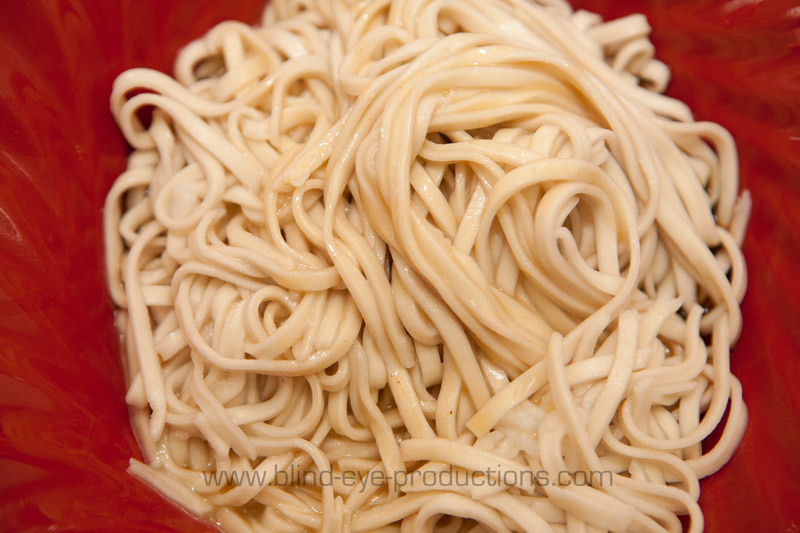 Lastly, we had the Noodles in Special Sauce. I don’t know what was so special about the sauce as it was pretty horrible. It just looked like a bowl of wet noodles. I don’t know how they were able to do this but it managed to look wet but have the consistency of chalk when eaten. Definitely the worst dish I’ve sampled so far on the monster review. Order this dish at your own risk. This review should be preceded by saying this was the fourth, yes 4th, place we tried that day and I was pretty much entering into a food coma. 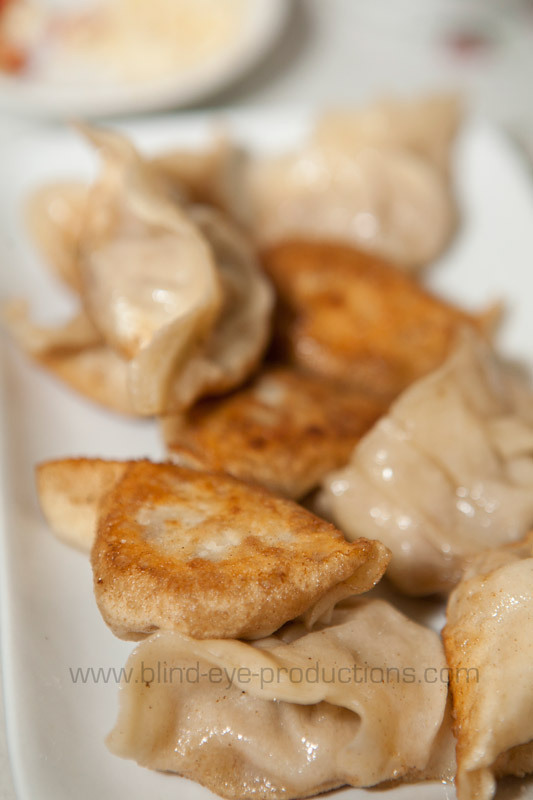 The dumplings were fine. Not the best of the day but not bad. The spareribs were nice. Great sauce, and a decent amount of meat for each bite. 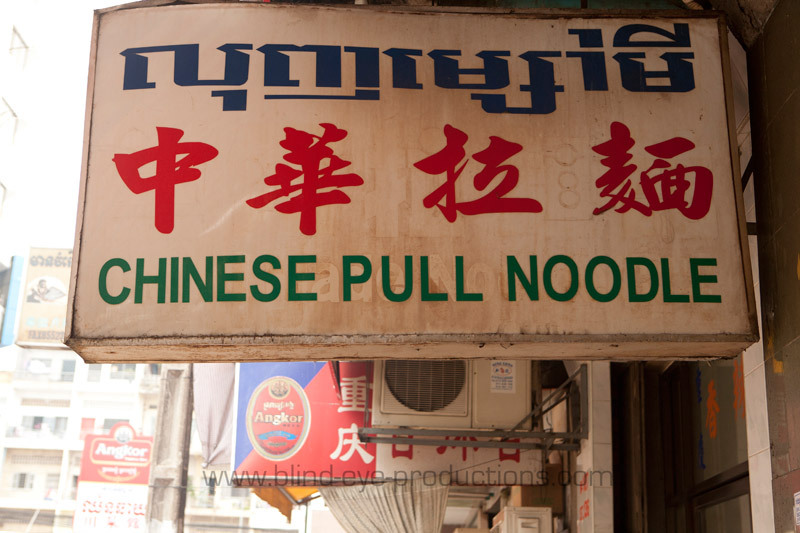 The noodles with special sauce were not even worth mentioning. While falling into a food coma, I wasn’t interested in exploring the more of the menu but if they do have peking duck, I would try this spot again for dumplings and duck. Shan Dong was the next on the list to try and I found it to be quite the same in terms of interiors from the rest of the restaurant row. 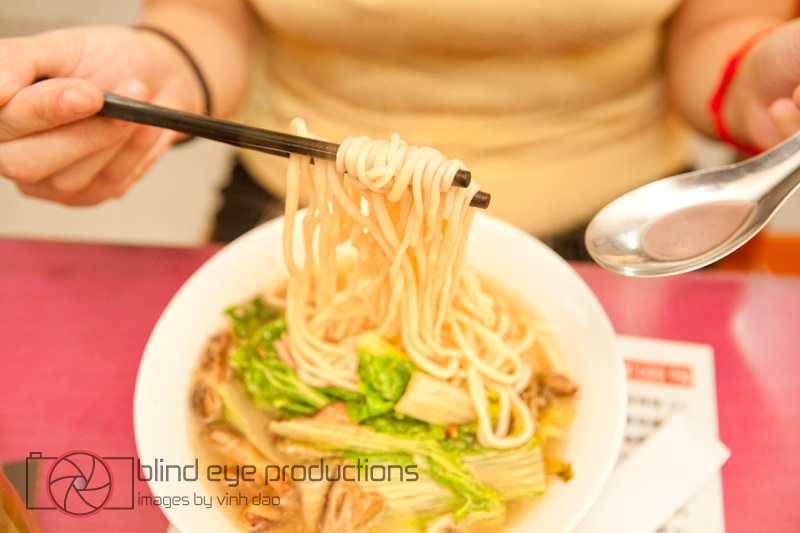 Usually when you sit down at these places, the waitress will put down the generic small plate, bowl for soup, a saucer for dipping sauce, soup spoon and chopsticks. 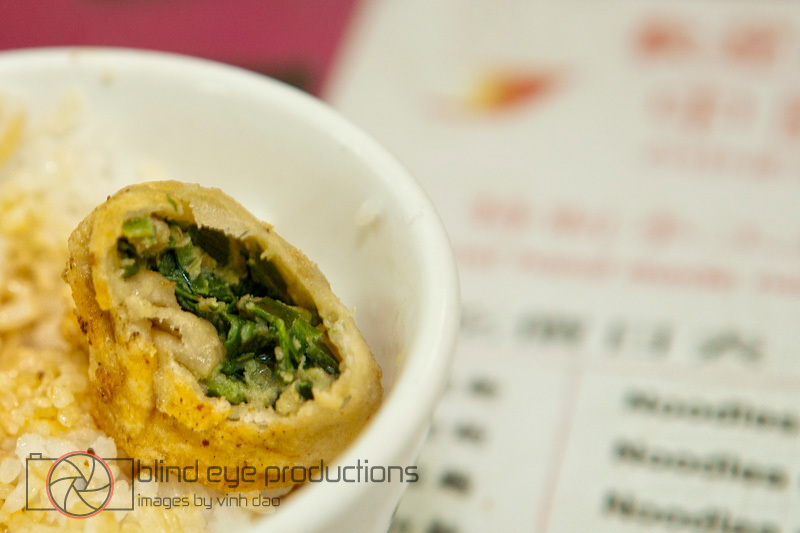 Shan Dong elevates it a bit by offering some peanuts and a mouth scorching side of Kim Chi. Because of this change up, we decided to go a bit crazy and order a menu item over $2.00. 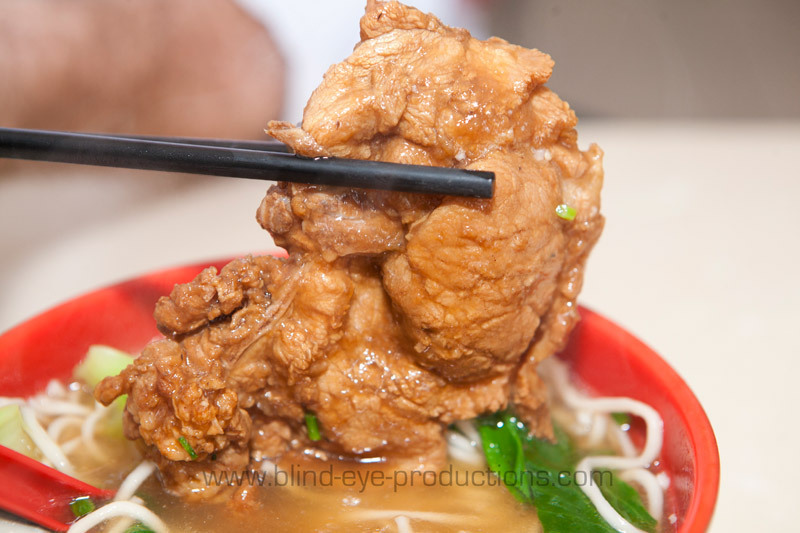 For the order, we had Fried Dumplings ($1.50), Noodle soup with Duck ($2.00) and Spicy Fried Beef ($4.00). 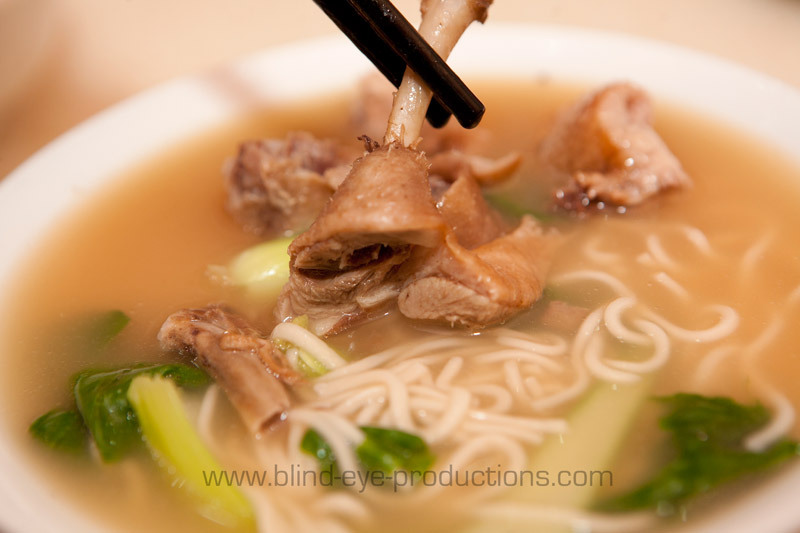 The duck soup was rich with the flavor of the duck prominent with each bite. 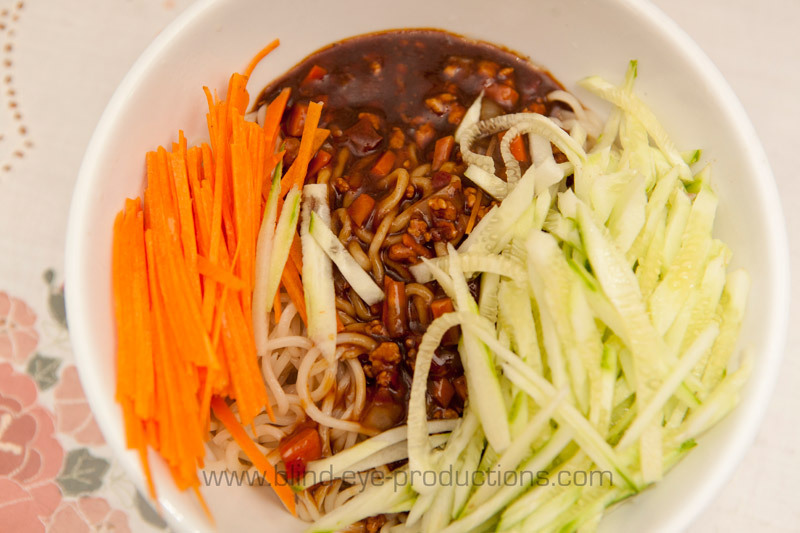 The bok choy was cooked al dente and added a greatly appreciated crunchy texture to the softer noodles. I also appreciated that it the fattiness of the duck was controlled and not overpowering. As a whole, it was a very solid dish that I would probably order again. 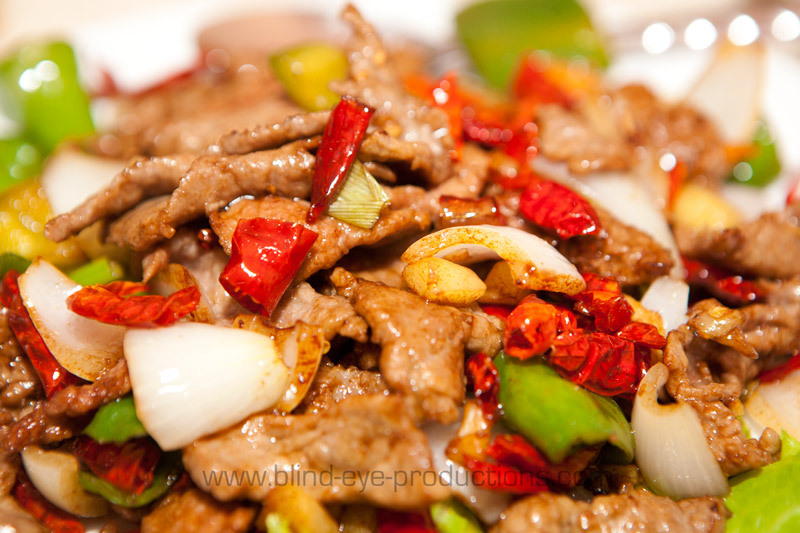 The Spicy Fried Beef was next. 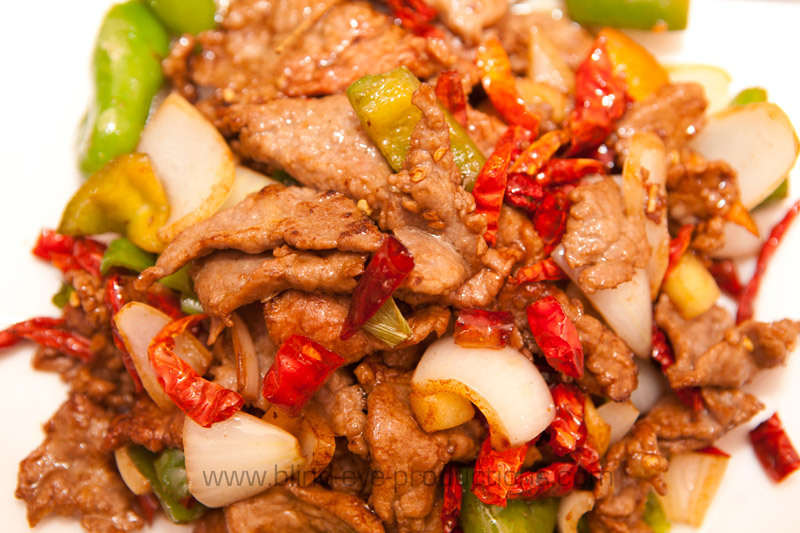 Green peppers, onion, ginger, and a whole bunch of chilies were stir fried up with some beef in a flavorful soy sauce. A pretty good dish but was a bit generic for my tastes. 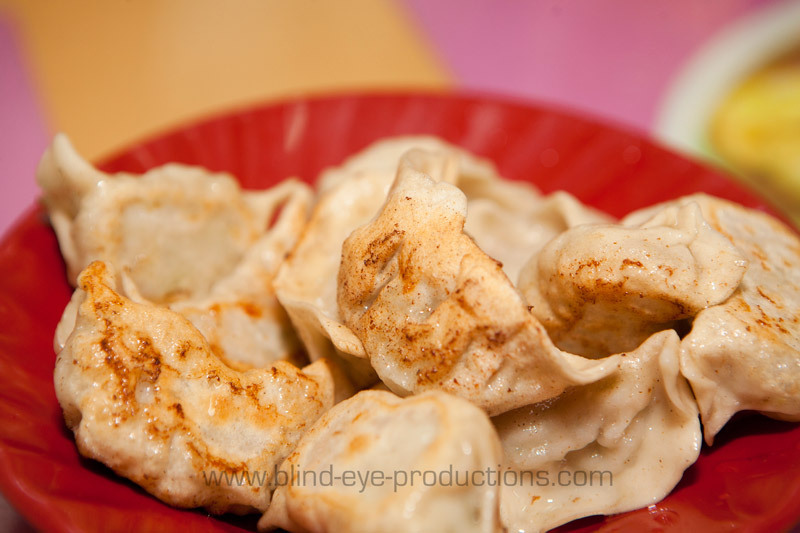 As for the Dumplings; well, they were very normal but tasted great when dipped in some soy and chili. As a whole, Shan Dong falls in the middle of the restaurants we have been to. 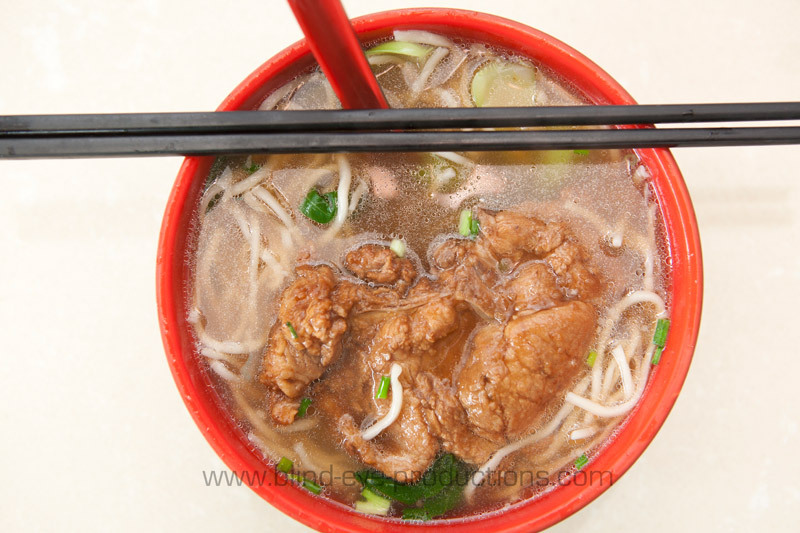 The duck soup was definitely my favorite with the other two dishes solid but nothing too impressive to write home about. The duck soup was delicious. Not overly flavorful but it smelled like eating a bowl of duck gravy … which is making my mouth water thinking about it. And the duck meat itself was great. 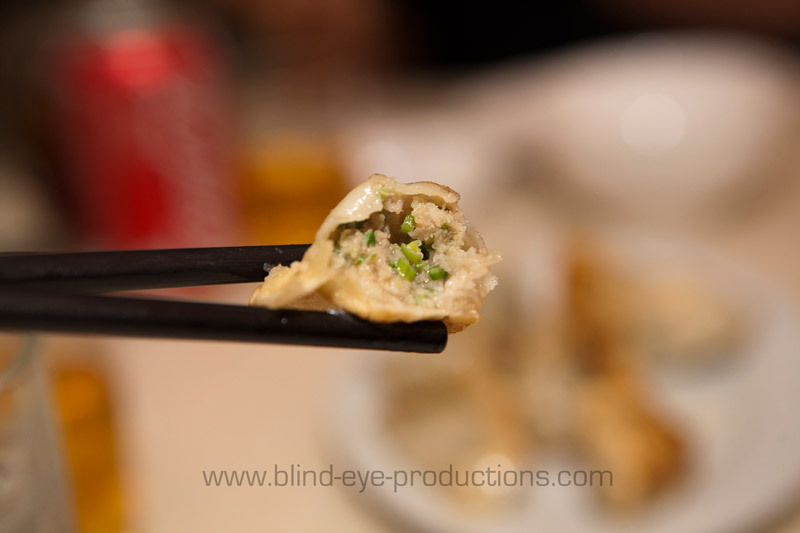 The dumplings were not stand out but pretty tasty. I really liked the fried beef. The stir fried veggies were really nice and the beef was surprisingly tender. But for all of the red chili peppers mixed in, it really wasn’t that spicy which was a bit strange. 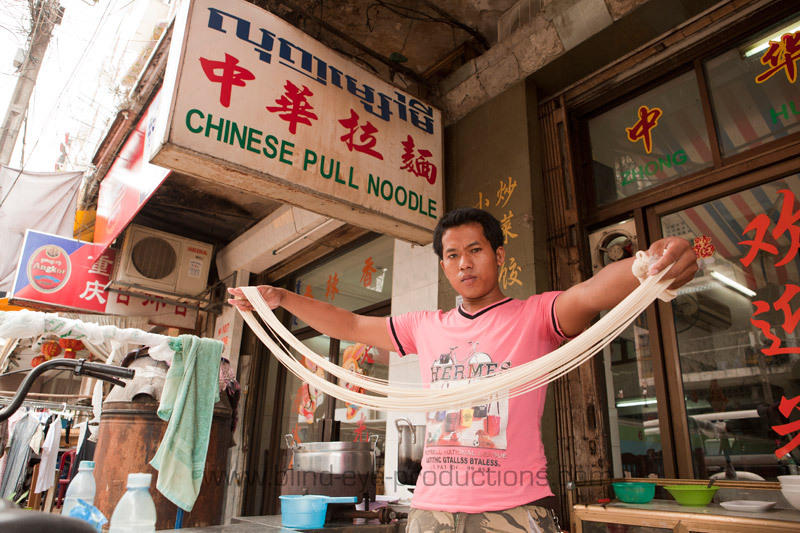 This restaurant lives up to it’s name and makes hand pulled noodles to order. The restaurant itself was pretty hot temperature wise as they didn’t turn on the air conditioning units until we walked in. Considering all the restaurants on the street keep their units on during lunchtime, it’s definitely something to take in consideration during the hot season. For the meal, we ordered Spicy Pork Noodles ($2.00), Fried Pork Dumplings ($2.00) and Fried Cake with Onions ($1.00). The Spicy Pork Noodles was to say interesting. 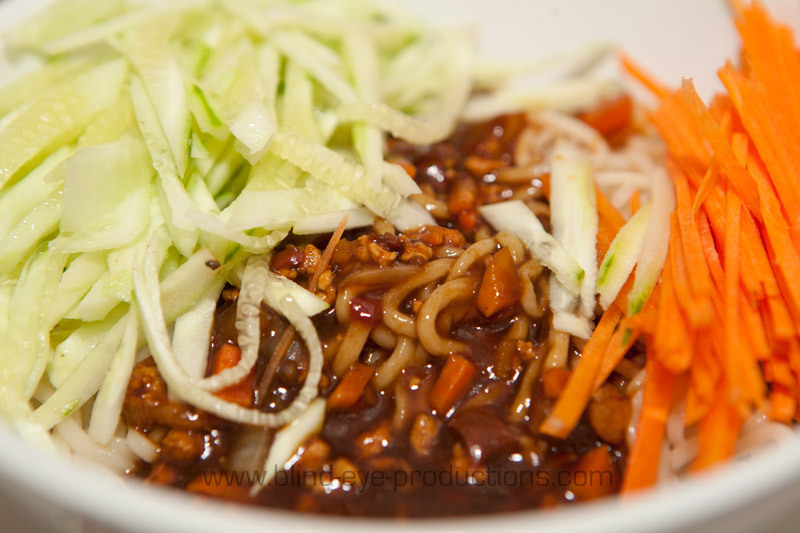 Over the cooked noodles, there was a spicy hoisin based sauce which had pork, water chesnuts, chili, and onion. It was garnished with a large amount of julienned carrots and cucumber. I didn’t think I would care for the dish at first glance but I really enjoyed the flavors. 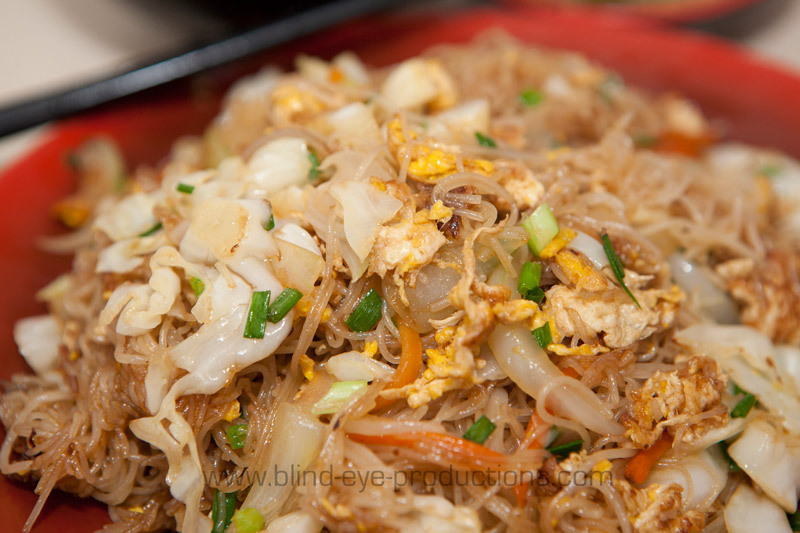 It reminded me of Vietnamese dish Bun Thit Nuong which is never a bad thing. 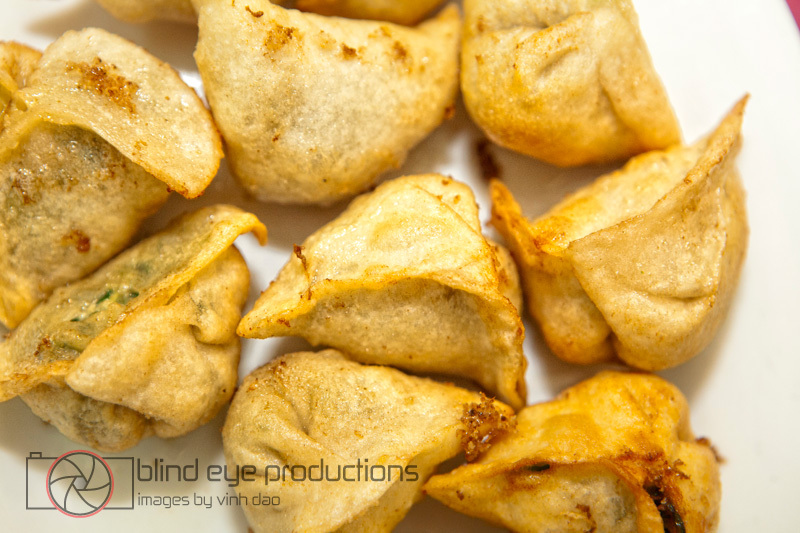 The Fried Dumplings were well formed and had a more than generous portion of meat to onion. 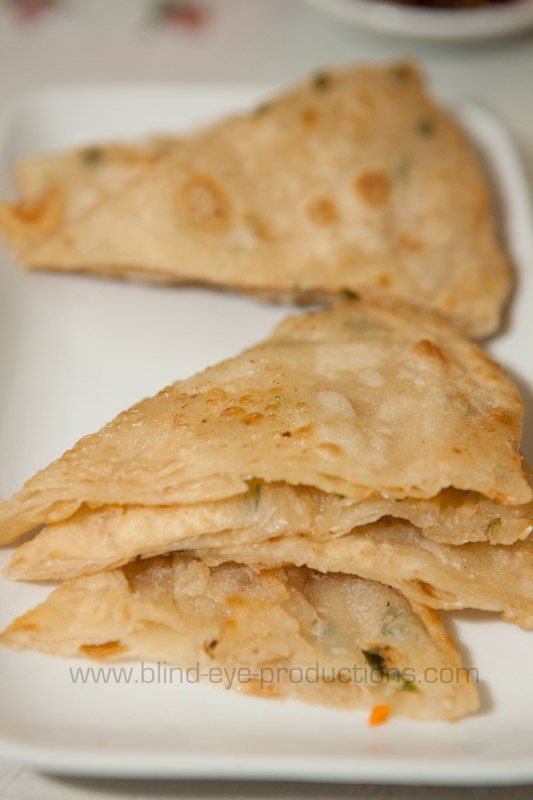 The Fried Cake with Onions was kinda like a chinese naan but deep fried. 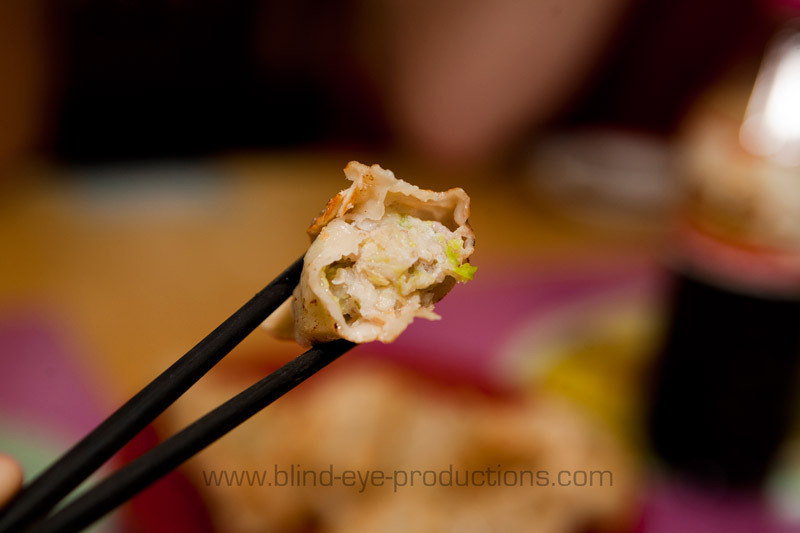 It was greasy mess that I couldn’t stop eating and tasted even better dipped in soy sauce. 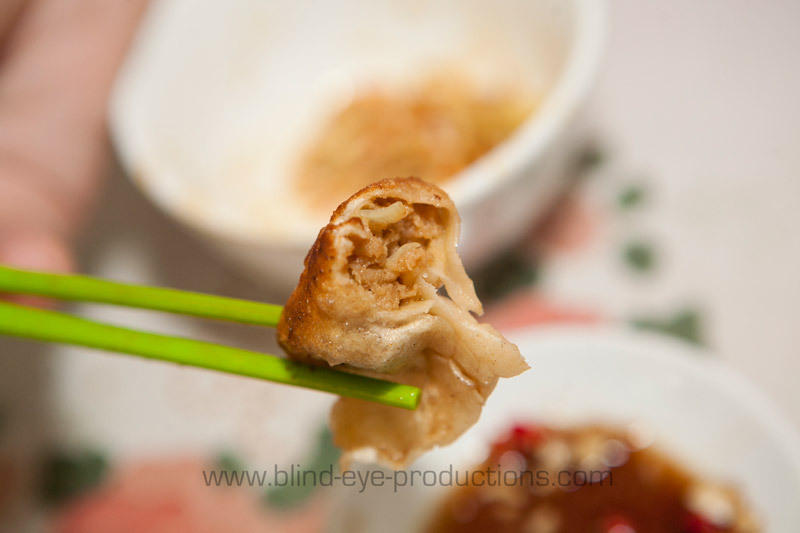 One bite of these fried dumplings and Chinese Pull Noodle shot to the top of my list of spots on this street; if not in Phnom Penh. 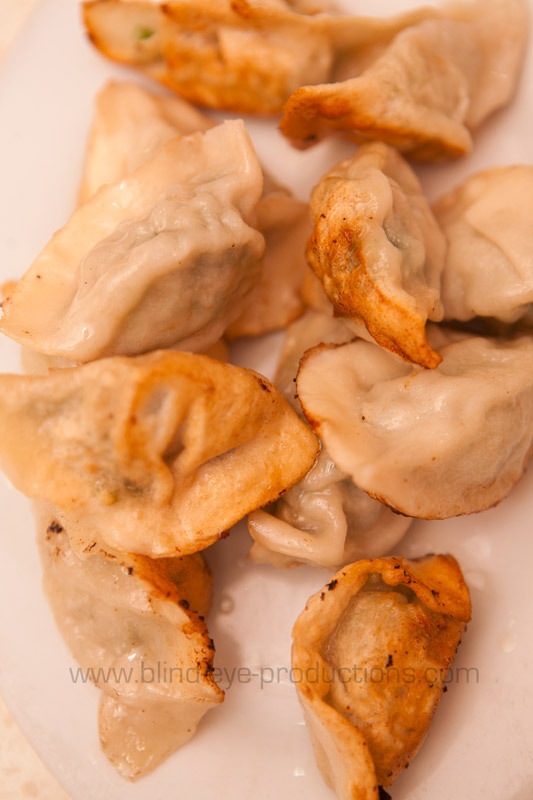 Maybe it was the disappointment of the boiled dumplings at the last place or maybe it was the unusually generous portion of pork in these guys but damn, these things are good. 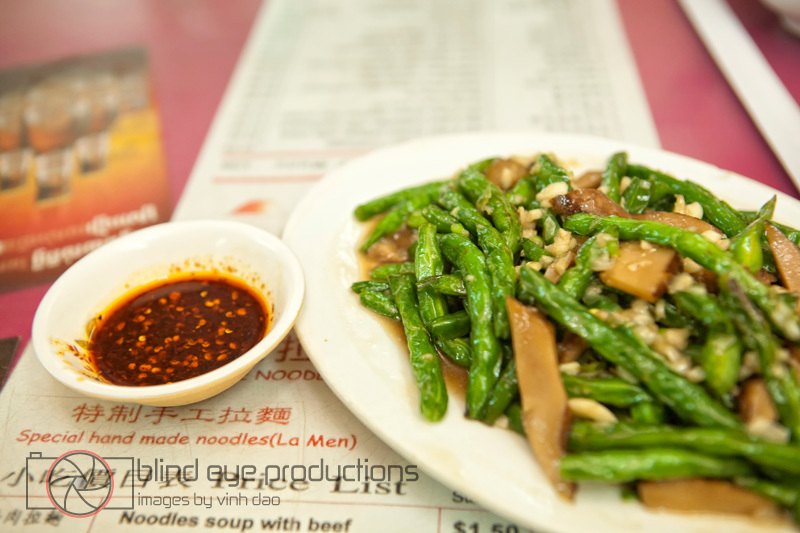 Herk Fung is the eastern-most restaurant on the street and is probably the cleanest. The interior was very modern and unlike it’s neighbors, it looks like there was some thought put into the appearance of the place. Let’s see if Herk Fung’s kitchen can deliver the goods. 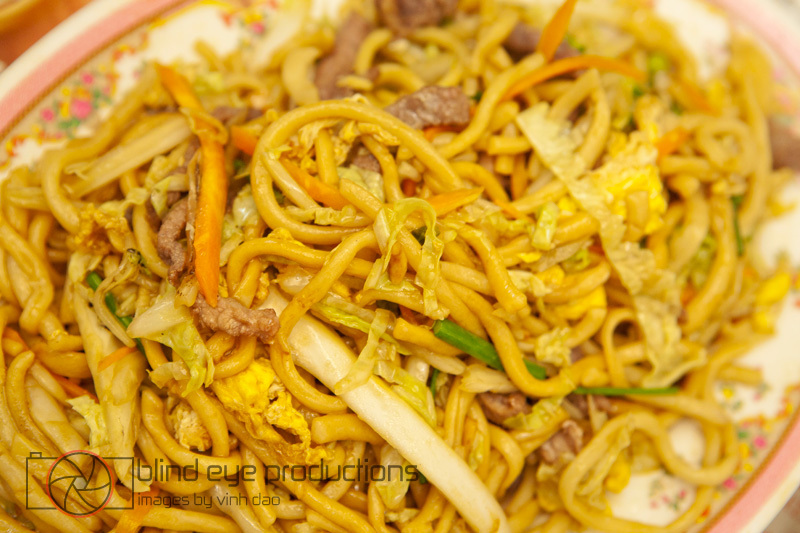 On this review, we had Stir Fried Noodles ($2.00) and a Pork Rib Noodle Soup ($2.00). The soup was a bit misleading as there were no pork ribs in it. Instead, there was a humongous pork chop that was flavorful and tender. Soy, star anise and garlic were some of the flavors that complimented the mainly pork tasting broth but I felt it still needed some extra seasoning. 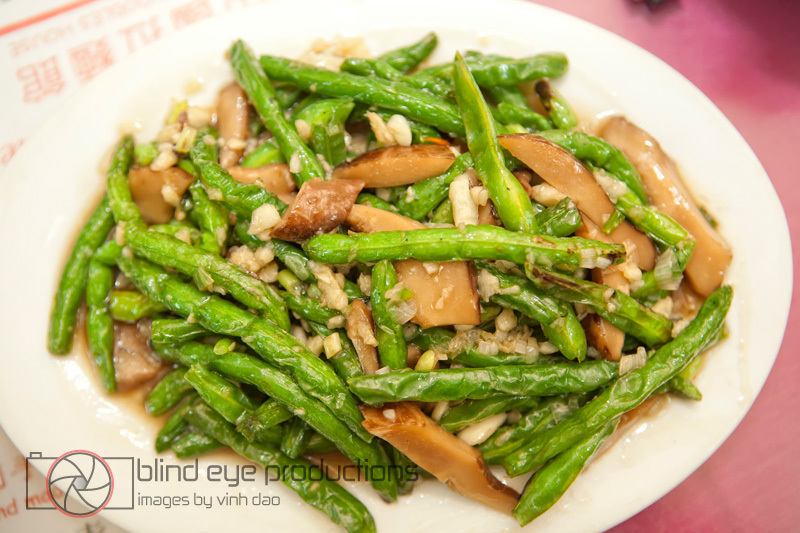 While the decor and great name makes Herk Fung stand out a bit on the Szechuan street, the food was not quite there. 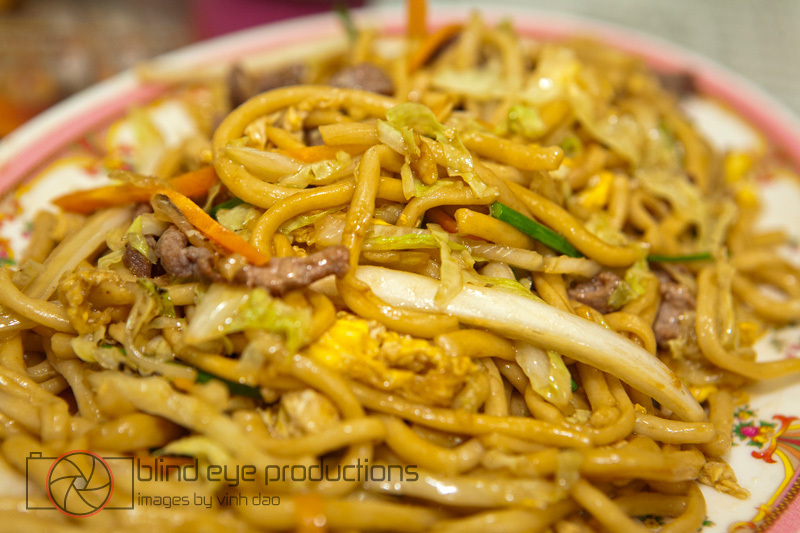 The stir fried noodles came out and looked great but somehow they had virtually no flavor. Not sure how you can have that many ingredients and somehow be able to have nothing to taste. The soup came out which looked interesting at first but then we pulled the titanic sized slab of pork out of the bowl. What are you supposed to do with a piece of meat that big with pair of chop sticks and a spoon? 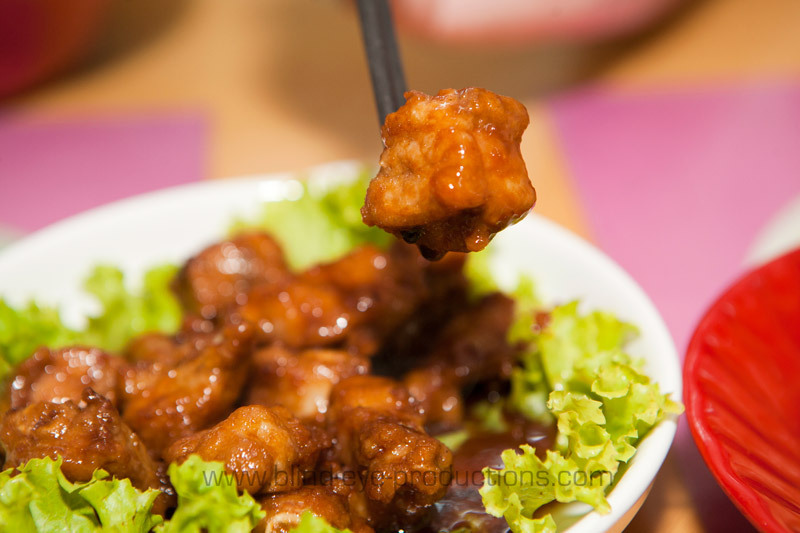 One of the nicest things about most Chinese dishes is that it’s all pre-cut and ready to eat. Not sure if we just don’t know the trick to tackling this dish or if the chef was just being lazy that day. 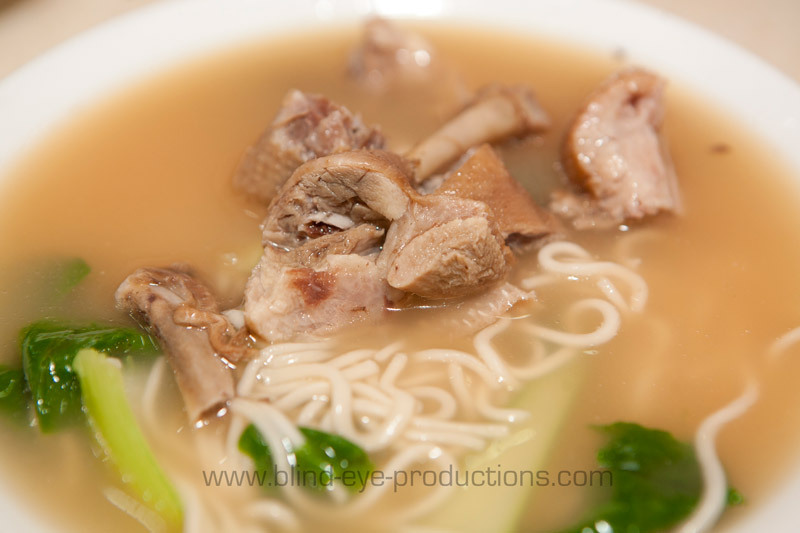 When we were able to some chucks torn off, the pork was not too bad, but the broth was pretty bland. Definitely not worth the effort or the extra 2000 Riel per dish.